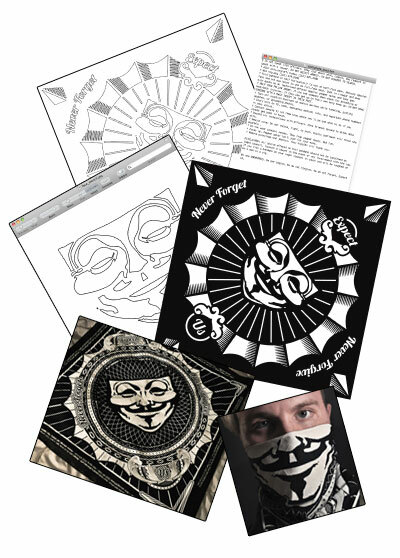 Coilhouse » Blog Archive » Coilhouse Presents: Matthew Borgatti’s OWS Bandanna Remix Pack! What inspired you to make these bandannas? It came about with a few thoughts colliding at once. I’ve made jewelry that attempts to pass off geeky things and web memes as classy eveningwear for a while. The Anonymous face has long been one of my favorites in this whole line. 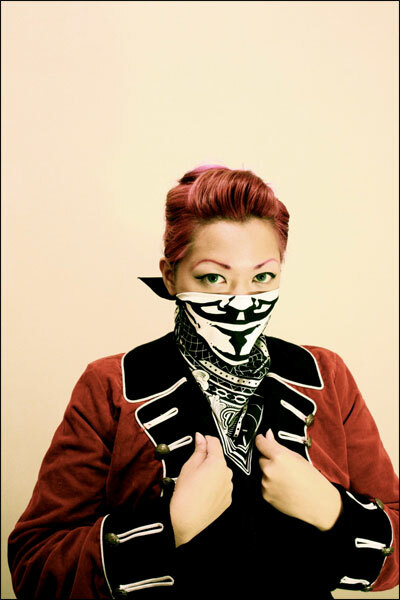 The idea of doing a bandanna, especially something that functions as a mask got planted in my head by Missmonstermel. Everything was stewing around my brain, with a half finished Illustrator document and the vague idea of someday making good on this whole thing when OWS burst on to the scene. 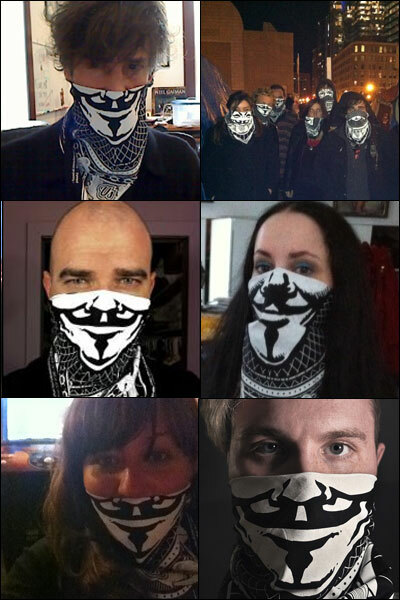 Suddenly people had a need for anonymity while making their voices heard. Suddenly people were rallying behind a mask. I pictured the effect something simple, useful, and portable could have, and I knew I had to make this happen. Can you talk about the collaborative process behind this, and all the folks that helped you along the way? So many aspects of this project completely relied on the intensely talented people I’m lucky enough to know. SFslim, Numidas Prasarn, and Melissa Dowell all helped shape the design with advice on composition, the exact framing of the text, and how it would work as a mask. Nick Farr had the brilliant idea of including the number for the NLG. Willow Bl00 helped proofread, and Melissa printed up the prototypes. I didn’t think it would have the huge surge of interest it’s had. I ended up finding a screenprinting company (a few oldschool punks with a small warehouse just outside my childhood home) called Dogwig that really helped me tackle the orders that flooded in. Since every bandana bought generates one that goes directly to an Occupation world wide, I’ve also got to thank all the folks who have been helping coordinate that whole effort. Nicole Aptekar, Eva Galperin, and Robin Jacks have been an enormous help in getting bandanas into the hands of people who need them most. FJ, you are correct. Matt says, “Yup. Not much I can do about it now, though,” meaning that the bandannas have already been printed. It reminds me of the infamous moment when I realized that I’d sent Coilhouse Magazine’s debut issue to print with a typo on the cover. What a day that was! I will fix it in the text document included in the pack ASAP, though! Good catch. How can Occupy protesters obtain the donated bandanas? @alder – I donate batches to occupations around the world for volunteers to distribute. It’s tough keeping ahead of orders, printing enough to have big batches to send, and keeping time with other projects, but I’ve been managing. There should be more going out next week. Cool, now I can make one that doesn’t fade away to nothing after one wash.